Control: DMX devices Set up to 512 DMX channels per cue. 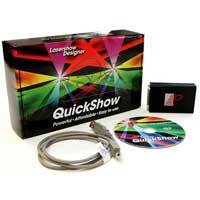 Unlimited number of cues or "looks"
Pangolin Quickshow is a full laser control software that was designed for live performance as well as for programming of laser shows. With nearly 2000 pre-loaded graphics, animations, beam effects and abstracts can everybody create quickly and easy the biggest laser shows. Pangolin Quickshow can be used for every Beamz Professional laser projector or other laser projectors with ILDA connection. Control: DMX devices Set up to 512 DMX channels per cue. Unlimited number of cues or â€œlooks"